These instructions are strictly the opinions of the author and should not refer or reflect those of the manufacturer. Always refer to your owner's manual for exploded views of your router and if you don't feel comfortable with these directions do not remove your springs. Step 1: With your router in the upright position you first must remove the micro adjustment knob. To do this you will need a knife. Note the seam around the top of the knob. Press the knife into the seam and twist it enough to pop the top of the knob off. Step 2: Inside the knob is a slotted screw. Remove this screw and the lock washer that is underneath it. 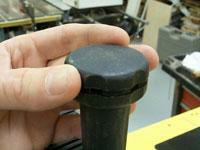 Now you will be able to turn the knob completely off of the threaded rod. Inside are also two nuts and an �O� ring. 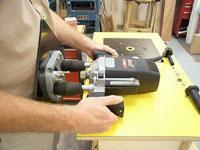 Step 3: Lay the router on it�s back. The lock is spring loaded so your router will be locked in position. Step 4: With the router on it�s back and the lock mechanism face down, press your body against the base plate, and your hands on the router, pull the lock mechanism. 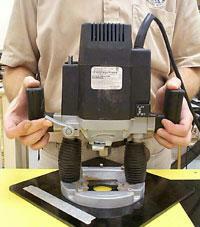 The base will press against you and will start to slide off. At this point you will have to release the soft plastic boots from the columns. Pull them away from the body and from the column base. 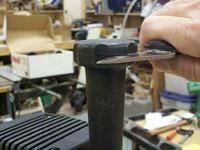 Step 5: When there is no pressure against you, grab the base and pull the base off. The threaded rod runs through the body also so make sure that you have pulled the base off far enough to remove the rod also. The springs will be hanging from the router. Step 6: Begin pulling the springs out of the body and as you pull, bend them down a bit. This will grab the metal tubes inside the springs. 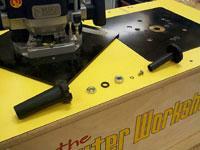 Step 7: Slide the base back into the router body. The easiest way to do this with this router is in the upright position. 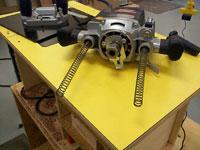 Release the lock handle and then slide the router body over the column. 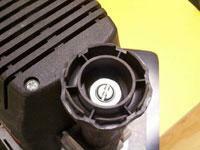 Make sure that the threaded rod slides through the top of the body housing. 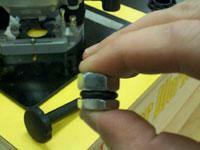 Step 8: Slide the micro adjustment knob back over the threaded shaft. 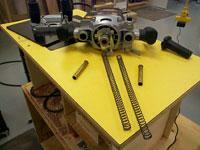 Now replace the nuts in the same order that they were removed. 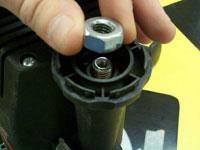 Re-screw in the slotted screw and lock washer and replace the cap aligning it even with the base of the knob.